The country’s largest municipal bankruptcy trial begins today in Detroit. WDET’s Sandra Svoboda is in the courthouse and will update this blog throughout the day…and continue doing so throughout the trial. Here, she and WDET’s Pat Batcheller discuss what to expect during the trial, which is technically a “confirmation hearing” on the city’s Plan of Adjustment. Ultimately, the judge will determine if the city’s plan is feasible and reasonable to creditors. 4:54 City attorney Bruce Bennett has finished for the day. He says he have about another hour tomorrow morning. Attorneys for the Detroit Institute of Arts and the Official Committee of Retirees say they each will have about 30 minutes of arguments supporting the city. Attorneys for creditors who object – including Syncora, FGC, the UAW, AFSCME and Macomb, Oakland and Wayne counties – will follow. 4:40 Bruce Bennett’s opening arguments in the Detroit bankruptcy case first reviewed why the Detroit Institute of Arts collection shouldn’t be sold to pay creditors. Now he’s moved on to a discussion of what additional revenues could be available. Read: taxes. He’s currently discussing why no additional monies are available from property owners, residents or workers in the city. 4:17 Opening arguments continue to focus on what started as “the DIA Settlement” that became the “Grand Bargain” when the state got involved, as described by city attorney Bruce Bennett. Not only is the museum an asset, it’s one that could be used to help lure residents back to the city, Bennett argued. But he continues to insist the art, by law, does not need to be sold to pay debt. “I don’t think any of the donors thought the art would be or could be sold to fill potholes, pay for the collection of garbage, or pay for any city services…” he said. The donated art, he said, went to the DIA Corp., not the city. 3:58 The Grand Bargain is being outlined, specifically the transference of the art to a new nonprofit, and the legality of it. Attorney Bruce Bennett reviewed Michigan Attorney General Bill Schuette’s opinion (found here) related to whether the city needed to sell the art to pay creditors. Bennett is now dismissing why a loan secured by the artwork is not a good idea. Creditors last week proposed such a plan. “We are here today finally to obtain that help and the purpose is no less than to save the city of Detroit. The city needs more net revenue than it has to provide adequate services and service legacy debs. … Detroit’s won’t survive if it isn’t done. The proposed Plan of Adjustment eliminates $7 billion of the city’s $18 billion of debt and provides for $1.7 billion in investments over the next decade. 3:30 City attorney Bruce Bennett began opening arguments at 3:20 p.m.. He started with listing some of the reasons for and results of the city’s bankruptcy: depopulation, blight, a deterioration of the quality of life. “The city no longer has the resources to provide its residents with the basic services,” he said. The Chapter 9 reorganization, Bennett said, can help reverse the decline, attract new residents and businesses and “reinvigorate” Detroit. 3:15 Judge Rhodes denies all of the motions except the one seeking to prevent the testimony of city attorney Evan Miller. The Court is on break until 2:10 p.m. when Judge Rhodes will hear one more pretrial motion and issue his decision on all of the other ones argued today. Then opening arguments will start. 12:43 Judge Rhodes moves on to issue of whether city attorney Evan Miller, of Jones Day, can be a witness in the case. The UAW, which represents library employees, listed him on its witness list. UAW attorney Peter DeChiara says Miller “is THE most knowledge person” on pensions and benefits and how the bankruptcy might affect the pensions and health care benefits for the Detroit Public Library. “We do not seek privileged information from him,” DeChiara said. “It’s not the lawyer’s’ job to testify in support of the plan,” Judge Rhodes told him. “I agree with you in general, however in this case, the individual who represents the city and has the knowledge to answer the questions that are relevant to the UAW’s case happens to be with Jones Day,” DeChiara said. 12:19 Judge Rhodes asks who else wants to be heard on any of the pretrial motions. First, Robert Gordon, attorney for the city’s retirement system, said the city was able to assess the impact of the plan on retirees. Barbara Patek, attorney for the Detroit Police Officers Association, used the phrase “business justification” for plan confirmation, though she was addressing the human dimension of bankruptcy and its affect on pensioners and employees. Neither she nor the judge could come up with a better term than “business justification.” Patek said because this is a municipal bankruptcy case, assets cannot just be divvied up – city services need to continue. 11:54 FGIC Attorney Ed Soto is now arguing that the city should not be allowed to present testimony and evidence about the validity of the $1.4 billion pension funding deal from 2005, also known as the Certificates of Participation claims. Here is the motion filed on the issue. Soto also argued the city should not be allowed to present evidence that would show the potential hardships that would be suffered by pensioners. Here is the motion on that issue. A few months ago, Judge Steven Rhodes declined to allow Syncora access to information about individual pensioners’ financial information and assets. 11:32 Ed Soto, an attorney for bond insurer Financial Guaranty Insurance Company is critical of the court’s mediation order, claiming it has been too broadly interpreted and has prevented discovery by creditors in pre-trial preparations. Syncora originally challenged the order in this motion, which the judge is being asked to rule on today in advance of the trial. The court’s mediation order has been unsuccessfully challenged by some creditors, including FGIC and Syncora, who wanted documents and witness testimony about how they grand bargain came about. They were unable to get it because the mediation order (ensuring confidentiality related to the negotiations) prevented their release. Soto described how Rip Rapson and Dan Gilbert have given contradictory statements — both publicly and in depositions — and creditors’ attorneys could not question them about the discrepancies because of the mediation order. Rapson is the president of the Kresge Foundation, a donor to the grand bargain, while Gilbert is chairman and founder of Rock Ventures and Quicken Loans. “Your argument assumes that the reasonableness of some other plan is before the court, it’s not,” Judge Rhodes said at one point. “My argument goes to whether there is sufficient discovery that would allow evidence that but for this money going toward the pensioners, (the grand bargain) would not have happened,” Soto said. Syncora attorney Stephen Hackney called it a “fundamental due process order” and argued for the mediation order to be lifted. In response, city attorney Greg Shumaker said Emergency Manager Kevyn Orr would testify about what came out of the mediation, specifically the grand bargain, not what happened in the mediations or what was said to the foundations during the process. Shumaker said, contrary to what Syncora and FGIC attorneys said, the city is not selectively using the mediation privilege. Stephen Hackney, attorney for bond insurer Syncora, is arguing a motion previously filed that would preclude the city from introducing evidence related to how much less pensioners would receive if the “grand bargain” funding was not included. The grand bargain is the agreement to bring $660 million of state, private, foundation and corporate money to pension funds so that retirees suffer smaller cuts to their monthly payments. “These are recoveries under the Plan,” Hackney says. Syncora stands to lose hundreds of millions of dollars in the bankruptcy case, as the Plan of Adjustment now stands. The Bermuda-based company’s attorneys have consistently argued that they are experiencing “unfair discrimination” under the plan, in part, because the grand bargain monies only benefit pensioners, not financial creditors. Syncora also wants Detroit Institute of Arts’ holdings to be sold to pay creditors. City attorney Greg Shumaker. of Jones Day, is reviewing the state contribution agreement ($98 million to the General Retirement System and $96 million to Police and Fire Retirement System) and making other legal arguments related to procedure and what will be introduced. 10:27 Tweeting from court today (going counterclockwise around the media room) are @WDETSandra, @NathanBomey, @MattHelms, @ChadLivengood, @CharlieLangton. 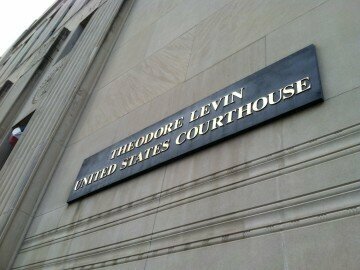 @RobertSnell and @RoopRajFox2 are elsewhere in the federal courthouse. 10:05 Attorneys for the city and creditors are discussing witnesses, exhibits and other items related to procedures at trial, which will begin later today. Most witnesses will be sequestered. 8:30 a.m. For more than an hour, Judge Steven Rhodes heard arguments for and against issuing a temporary restraining order that would halt water shutoffs in the city. A summary is here.